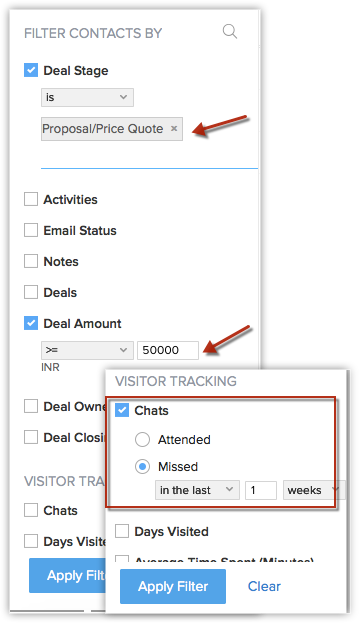 On using website visitors information inside CRM. When you are a sales person at a physical store, you can mostly tell if a customer is really interested to buy something or he/she is simply a window shopper. You can decide on your pitch and conversation accordingly. On the other hand, when you are working with leads online and over the phone, you can never be quite sure. Not until you have their visit information contextually accessible. The website visitors' information inside Zoho CRM increases your chances of reaching your leads and your conversion. Let's see how! When you are all set for the day, during the best time of the day to do the hard sell, uninterested leads or leaving voice messages could be a total put off. 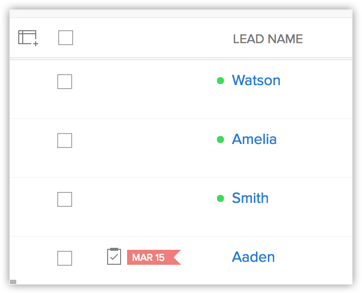 Here's a trick that can save you - Look out for the green dots in the Leads/Contacts list view. These leads and contacts are currently viewing your website pages and are available to hear your offering. You can go ahead and call them right away. Or you could also send a mass email by clicking Select All Online leads in this page link that appears right after you select one. Anyone who has spent a good deal of time on your website is a clear prospect. It is the perfect time to make your pitch and try to convert. You can quickly run a filter in Leads module based on the Average Time Spent (Minutes) and Pages visited. Don't let a missed chat become a missed business opportunity. When you are working on a big deal that is about to close anytime soon, you don't want to miss it on account of a missed chat. So you can simply run a filter when you are in the Deals and Contacts modules based on the Missed Chats.